I posted this a few months ago even cheaper than this but not seen a decent price until now. I will personally wait a little longer though. It's a decent headset. I had one for a while. Sound and mic are really good. It's really flimsy, though. The plastics around the area where the earcups meet the headband cracks easily. I had to return mine. It's a decent headset. I had one for a while. Sound and mic are really …It's a decent headset. I had one for a while. Sound and mic are really good.It's really flimsy, though. The plastics around the area where the earcups meet the headband cracks easily. I had to return mine. oh thats interesting. How long did you have it before it broke? Around 7 or 8 months, I think? It's a shame because it was great otherwise. Worked flawlessly on PC and PS4. Around 7 or 8 months, I think?It's a shame because it was great otherwise. …Around 7 or 8 months, I think?It's a shame because it was great otherwise. Worked flawlessly on PC and PS4. would you say the kraken 7.1 would be a better purchase? I honestly couldn't tell you, I've never owned or used a Kraken. I don't think I'd buy another Razer product, though. The build quality was so bad. I honestly couldn't tell you, I've never owned or used a Kraken.I don't …I honestly couldn't tell you, I've never owned or used a Kraken.I don't think I'd buy another Razer product, though. The build quality was so bad. 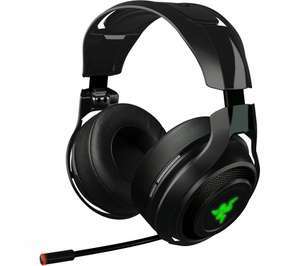 I have this headset and it's already falling apart after light use what headset did you replace it with? I have this headset and it's already falling apart after light use …I have this headset and it's already falling apart after light use what headset did you replace it with? I got a Steelseries Arctis 7. Seems okay so far. Thanks for the reply, I actually replaced the Arctis 7 with the man-o-war as I found it quite uncomfortable. The search continues!